Of all the amazing that God does throughout the events of the Christmas story, the most amazing thing—indeed, the most difficult—is that God provided a way for all of humanity to be saved through faith in Christ. As I say in this sermon, Jesus was born so that he could die. In this morning’s sermon I talked about the magi, who lived most likely in Babylon, in the Persian Gulf region. The magi lived about 700 miles east of Bethlehem, where Jesus was born. How did God get these men to travel such a great distance to find Jesus? If the star was a miraculous astronomical event, God created it out of nothing. If it was a natural event, God designed the universe in such a way that at just the right moment in history this natural astronomical event would appear in the night sky, get the attention of the magi, and inspire them to travel those 700 miles to see the newborn king of the Jews. In my sermon I said, “Just think: For the sake of saving a few lost, superstitious, idolatrous, pagan, polytheistic men, God literally moved heaven and earth to lead these men to salvation through Christ!” Like it was nothing at all! Isn’t that amazing! God is amazing! The scribes and the high priests—the Bible scholars of the day—knew that Bethlehem was the place where the Messiah was to be born. One small problem… The Messiah’s mother, Mary, was going to be having a her child very soon, and she’s 80 miles north of Bethlehem in Nazareth. If you’re God, how will you get her from point A to point B? You will put it in the mind of the most powerful ruler the world had ever seen to take a census of his empire—and require that everyone must return to their ancestral homeland. And voila! Problem solved. Crisis averted. The Messiah was born in Bethlehem, just as the Old Testament said he would be. One pastor points out that God doesn’t do things “efficiently”—whether it’s moving heaven and earth for the sake of a few astrologers, or moving tens of thousands or hundreds of thousands of people around an empire like pieces on a chessboard—all for the sake of moving two of the world’s more “insignificant” people—Mary and Joseph—from Nazareth to Bethlehem, so that prophecy can be fulfilled. It’s almost like God is showing off—the way he does things! This is not hard for God. God is amazing. For my sermon tonight, I want to focus on some amazing words—surely some of the most amazing words ever uttered—the words of the angel in verse 11: “For unto you is born this day in the city of David a Savior, who is Christ the Lord.” In fact, I want to focus tonight’s message mostly on one word in this one verse: and the word is Savior. So right here at the beginning of Luke’s gospel, and right at the beginning of Matthew’s gospel, we are told that the main problem we face as human beings—the problem that God sent Jesus to solve—is our problem with sin. All other problems we face are secondary to this main problem. And as much as Jesus has inspired, empowered, and motivated his followers throughout the centuries to help solve the world’s problems—humanity’s problem with sin will always be the main problem he came to solve. Jesus will make this same point later in the gospels. Remember that episode involving four friends and their paralyzed friend. They’re carrying their friend on a mat. These friends have heard about Jesus—perhaps they’ve seen him. They know that he has the power to heal people—physically: to make the lame walk, the blind see, the deaf hear. And their friend can’t walk; he’s disabled; and they know that if they can only get their friend to Jesus, Jesus will heal him. The only problem is, they show up at the house in Capernaum where Jesus is preaching, and it’s standing room only. It’s like showing up a concert and it’s sold out. If there were a fire marshal in Capernaum, he would have surely said that there were too many people for this event. So the house was overflowing with people, and these four friends can’t get their paralyzed friend to Jesus. But they’re persistent and resourceful. Instead of giving up, they climb onto the roof, which is made of thatch—so it’s made of mud and straw mixed together. And they climb on top and literally break a hole in the roof just above where Jesus is preaching, and they lower their friend on his mat down through the roof… to Jesus. And what does Jesus do? He says some shocking words: “Son, your sins are forgiven.” These words are shocking to the four friends because we suspect that they wanted Jesus not to forgive the man’s sins, but to heal him physically, so that he could walk again. Right? But what do we see Jesus do? He forgives the man’s sins. And Jesus, at this point, seems perfectly content to leave it at that. That’s all Jesus is going to do—after all the trouble these four friends go to in order to have their friend healed, and Jesus doesn’t even heal him! Or so we think. For the scribes and Pharisees, however, it wouldn’t have shocked them to see Jesus heal the man physically—I mean, that would be impressive, but they wouldn’t have turned on Jesus the way they did. No, what’s shocking for them is that Jesus told this man that his sins were forgiven. Because they rightly understood that no mere man can forgive someone’s sins. Only God can forgive sins. Who does Jesus think he is—forgiving someone’s sins? So they accuse Jesus of blasphemy: It’s blasphemous for any human being to forgive someone’s sins. Only God can do that! Well, Jesus knows what they’re thinking, so he asks, “Which is easier—to say, ‘Your sins are forgiven’ or ‘Take up your mat and walk.’” And of course it’s easier to say your sins are forgiven because the forgiveness of sin is an invisible spiritual reality—you can’t prove it one way or another. So of course Jesus knows that it’s easier to say your sins are forgiven. Who’s going to know whether forgiveness happened or not? So Jesus does the seemingly harder thing, which is to say, “Take up your mat and walk”—as a sign that he also has the power to forgive sins. But from Jesus’ perspective, the physical healing was practically an afterthought. If these scribes and Pharisees hadn’t question his authority to forgive the man’s sins, he wouldn’t have even bothered to do it! From Jesus’ perspective, forgiving the man’s sins is the hard thing; healing him physically is the easy thing. We’re the exact opposite of Jesus: We think that the “easy” thing is for Jesus to forgive sins; forgiving sins is a light thing, an easy thing, for Jesus to do; the hard thing—the really impressive thing—is physical healing. This story resonates with me because my own father died at Christmastime—22 years ago last Thursday, in fact. He died of terminal cancer. And early on in his disease, I prayed—my mom prayed, my sisters prayed, my dad’s friends prayed—for real physical healing. We prayed for God to eliminate or send into remission this terrible cancer that was destroying his body. And trust me: We knew that by praying for this, we were most assuredly not asking God to do a light thing, an easy thing; if God were going to answer our prayer it would take a great miracle on God’s part! And God did not grant our petition. Dad was able to receive some chemotherapy that slowed down the progression of the disease and prolonged his life for many months. But he would succumb to this cancer a few days before Christmas in 1995. At the time we were like those four friends: Healing Dad’s cancer seemed so hard. Healing Dad’s soul by forgiving his sins…? That didn’t seem like nearly as big a deal. Isn’t that funny? But here’s the truth, as I understand it now: the cancer killed him, but my father was absolutely healed—healed in the only way that matters; healed in the only eternal way that people can be healed. He was healed spiritually—because his sins were forgiven! During his last year of life, he trusted in Jesus like he never had before. He read the Bible like he never had before. He prayed like he never had before. He found Jesus—possibly for the first time in his life. He found forgiveness of his sins! He was healed! Even if the Lord had healed my father of his physical disease 22 years ago, he would likely be dead by now, because any healing other than spiritual healing and forgiveness of sin is strictly temporary! So I’m glad that the angel is right when he tells these shepherds that unto us is born this day a Savior, who is Christ the Lord. I’m glad that the main reason Jesus came was to save us from our sins! Because that’s an eternal kind of healing! For me, the good news of Christmas that I need to hear right now is that God sent his Son Jesus into the world to heal Alton White eternally. And I know I’m speaking these words to some people in our church family whose hearts are heavy right now. Paulla, Brian, Brittany, Ashley, David… Ed. This will be the last Christmas that Pat will be with them—and us—on this side of eternity. And it’s sad to think about what we’re losing when we lose Pat. So Pat’s family and Pat’s brothers and sisters in Christ need to hear the good news of Christmas: God sent his Son Jesus into the world to heal Pat Surette eternally. And for everyone else during this season whose hearts are heavy with grief, hear the good news of Christmas: God sent his Son Jesus into the world to heal your loved one eternally. Because we are Christmas people. And we celebrate alongside these shepherds and these angels this amazing proclamation: “unto you is born this day in the city of David a Savior”—not a surgeon, not a scientist but a Savior—so that all of us who turn to Christ in faith will find that our sins are forgiven, and we have eternal life. 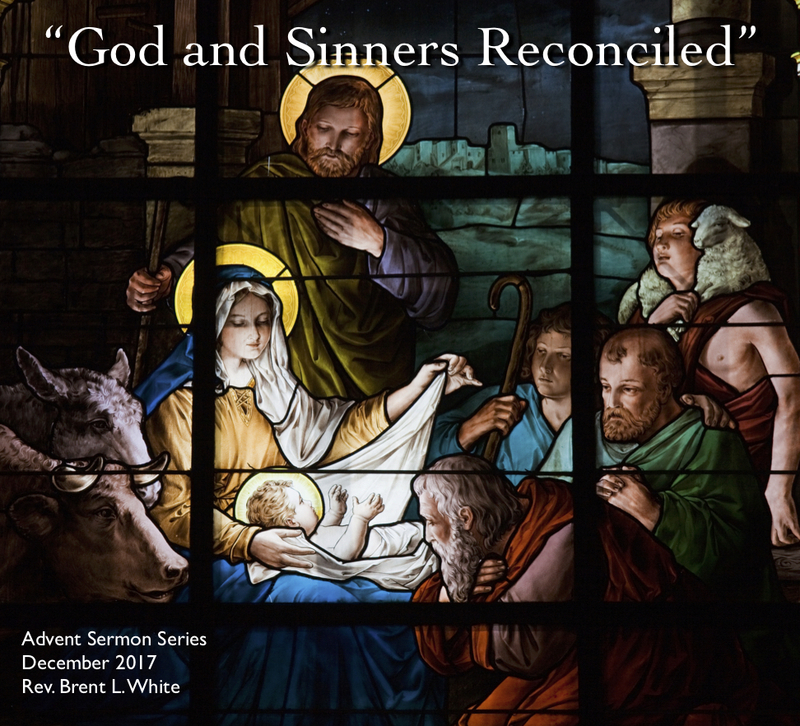 I began this sermon talking about how easily God can do miraculous things like get the most powerful ruler the world had ever seen, Caesar Augustus, to call for a census, which would in turn bring two “nobodies” from the world’s perspective, Mary and Joseph, from Nazareth to Bethlehem. Or literally move heaven and earth to get a few lost sinners to travel 700 miles to west to Bethlehem, so they can meet Jesus and be saved. This is not hard for God. It’s not hard for this same God to make a paralytic walk, or a blind man to see, or a hemorrhaging woman to stop bleeding. It’s not even hard for for this same God to raise someone back to life. That’s not hard. This is what forgiveness of our sins cost God. God paid for forgiveness with the blood of his Son Jesus. Which is to say, because God is a Trinity, God himself paid for it with his own blood on the cross. That’s the only way forgiveness was possible—that God could somehow become one of us; live the life of perfect obedience to the Father that we were unable to live; die the death that we deserved to die; and suffer the hell that we deserved to suffer. In our place. Because God loved us that much. God purchased our forgiveness with the shedding of his own blood, the only way forgiveness is possible. And how does God have blood in the first place? How does he have a body that can bear the punishment for our sin? How does God become a perfect substitute for us human beings in the first place? How does God die in order save us? And that is the meaning of Christmas. That is what we are celebrating this evening. One final thought: Look at v. 14: “Glory to God in the highest, and on earth peace among those with whom he is pleased!” With whom he is well pleased. This sounds like something that God will say later in the gospels when Jesus is baptized: “This is my beloved Son with whom I’m well-pleased.” And now the angels are announcing that the relationship that God the Son enjoys with his Father is now the relationship that those of us who are in Christ enjoy! Because of what Christ did for us by becoming human and dying on the cross, God is now well-pleased with us! We are now God’s sons and daughters! God loves us the same way he loves his Son Jesus!